Several things can go wrong when you are baking a cake; one of the most common problems is when the outside burns. Often, even though the exterior of the cake has burnt, the batter on the inside is still not cooked. Keep the exterior of the cake from heating too quickly and ensure the interior cooks evenly. Approximately 10 minutes of extra preparation time is required to ensure you do not burn the outside of the cake. Use an oven thermometer to monitor your oven’s temperature rather than trusting the dial. Many ovens bake higher or lower than the temperature you set them to. 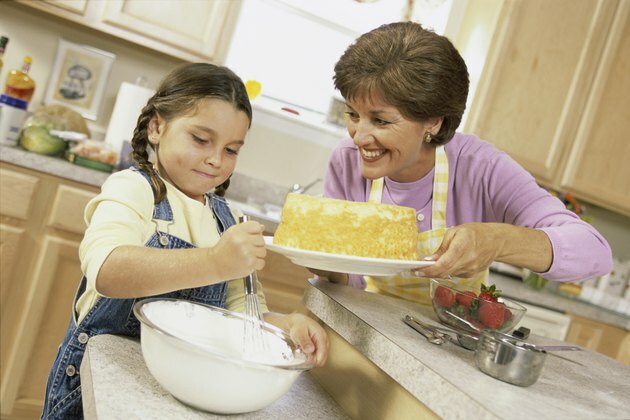 Adjust your oven to reach the required baking temperature based on the reading from the oven thermometer. This will prevent the oven from getting too hot and burning your cake. Place a rose nail into the center of the cake pan before pouring in the batter. The rose nail will transmit heat to the center of the cake, ensuring it cooks evenly. Most specialty baking stores sell rose nails. Set the cake pan into a larger baking pan and arrange dishcloths in the space between the pans. Add enough water to the dishcloths to ensure they are all damp. This strategy ensures the exterior of the pan does not get too hot and burn the cake. Cover the cake with a sheet of aluminum foil halfway through the baking process to prevent the top of the cake from burning. Remove the cake from the oven as soon as a knife poked into the center comes out clean. Allow the cake to cool and remove the rose nail. Ice and serve the cake as normal. The rose nail might leave a small hole in the top of the cake. You can easily cover this hole with icing.